The Adepta Sororitas Simulacrum bearer was made from a Seraphim leader. 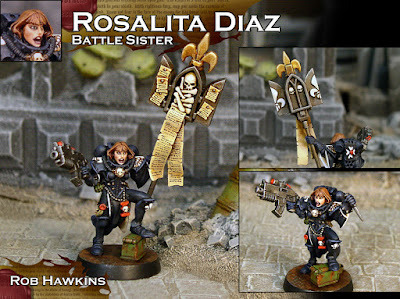 The power sword was removed so her left hand could hold the banner pole, and the plasma pistol was removed from the right hand and replaced with a bolter. The model's left leg was separated and the upper thigh resculpted to give her a pose as if she's standing on something. The tunic was also resculpted to match her new pose. The final model was put on a base with her foot on an ammo case. Some thick gauge floral wire was used fore the pole, and her icon was remade from plastic card. The pieces she's holding are modular, so I can equip her with the Simulacrum pole, or a combination of pistol or knife and boltgun. The Simulacrum itself was converted out of one of the Necromunda gang relics. I added a Bretonnian fleur-de-lis symbol on top, and sculpted one on the back of the doors. The handing litany was made from styrene card. I also painted up the Necromunda tentacle monsters. These are perfect for representing the monster in the Scavengers mission– Having it on the table serves as a visual reminder to roll for the monster at the start of each turn, and if the monster shows up, I place it next to the fighter that's being attacked. If the second roll results in the character fighting the monster, I leave the tentacle next to her to show that she's occupied, and unable to do anything else for the turn. If the monster takes the fighter out of action, I leave the tentacle in its place. After my gang fight against the Harlequins, the Keepers of the Sacred Sword faced a band of Chaos Marines in a scavenger hunt. Angelica, Loralinia, and Dominica managed to take out three cultists and the kill team leader, while Silvia and Ophelia managed to take out another Chaos Marine before both getting shot to pieces. Ophelia was killed and Silvia had a painful recovery. The monster took out the enemy gunner (I was relieved to see the marine armed with an auto cannon vanish in a flurry of tentacles). Even though the enemy kill team was losing men left and right, my opponent kept passing his bottle tests. Once Ophelia and Silvia went down and I had to make my first bottle test, I failed it and lost the game. I managed to take an enemy prisoner, though. We are waiving the Rescue mission, and instead paying a ransom of one promethium cache, which allowed me to pick up two for the battle. I spent 100 points to replace Ophelia Wells with Olivia Braun, my new orange-haired gunner. (See what I did there?) But I couldn't afford to buy a weapon for her. Silvia was missing this battle, so I went into the next mission with only three armed fighters. It was another scavenger hunt against Tyranids. As soon as Loralinia Moss was taken out, I voluntarily bottles out. It's mostly pointless to fight Tyranids at all, no less when you don't have anyone on your team. So, that's three games and three losses. I've been focusing the advancements on my leader, Angelica, to get her Guerilla skills. She's got Survivor, Armorer, and Medic, and hopefully I'll be able to pick up Scavenger after the next game, which will give me another 50 points to spend after each battle. Then I'll be able to afford some much needed reinforcements. Terrific sculpting and conversion work there! 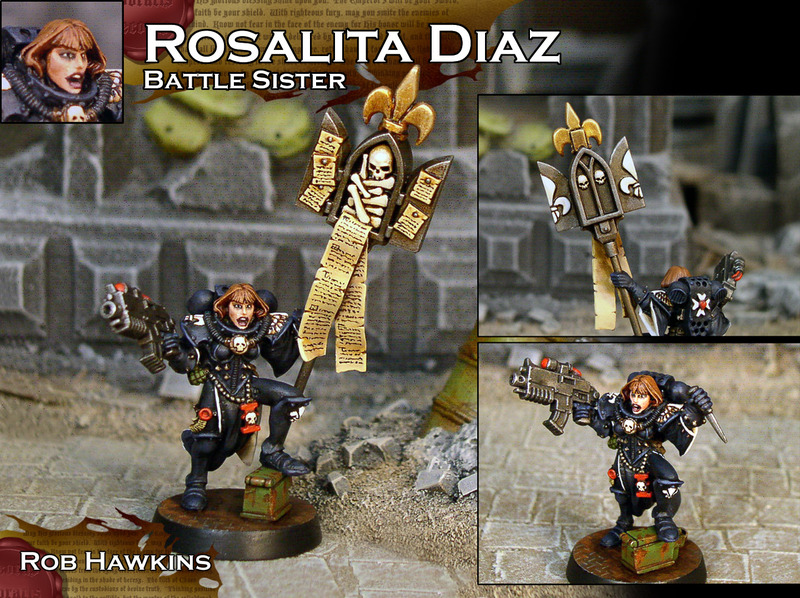 Absolutely wonderful conversion work, capped off with a beautiful paint job! Lovely conversion work. I think I like her best with the boltgun and standard. Thanks! The standard is her "final form," I only made the knife hand because she'll probably need to play at least one mission before I'll be able to upgrade her with the simulacrum. As a long tern Sisters fan, I think your doing them proud. Well done sir.